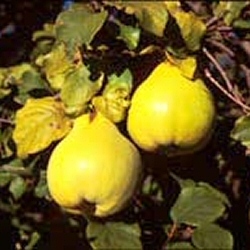 A popular Quince variety, first introduced in Serbia in 1800. Vranja (Cydonia oblonga 'Vranja') is a large, pale green quince, similar in shape and size to Meeches Prolific. Our Quince Vranja is supplied at a height of between 125cm and 150cm 7 - 12 litre container, which means that the tree has an already established root system and therefore this tree can be planted any time of the year and with better results than either bare-root or root-balled trees.